I started researching my family history when I was about 18 and, 32 years later, I’m still at it. It has become a lifelong, all-encompassing passion. For my 50th birthday recently I requested certificate folders so that I could properly file away all my copy birth, marriage and death certificates, of which there are many. And I’m not even mildly embarrassed by that admission. 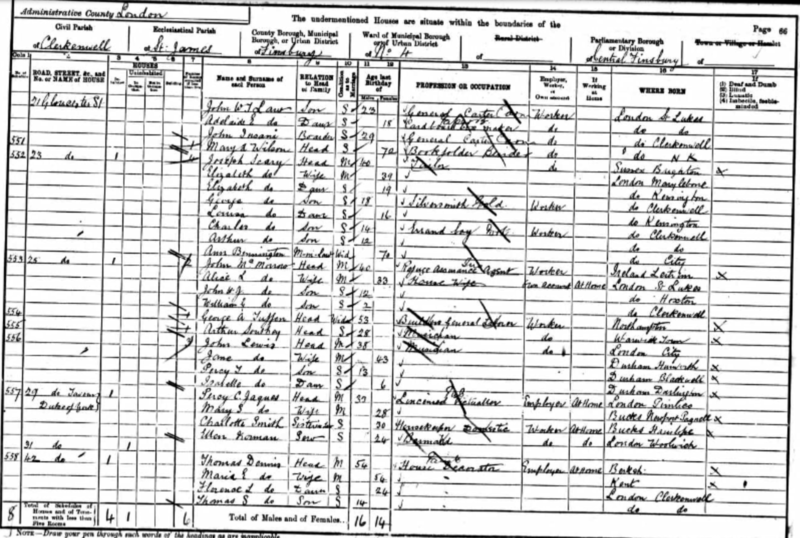 Her parents, Louisa Georgina Seary (fancy!) and Percy Temple, had lived next door to one another in Gloucester Road, Islington. Apparently Lou used to tease Percy and throw stones at him across the fence to attract his attention (brazen hussy!) Her mother, Elizabeth, seeing the way things were heading, warned that if Lou married Percy she would have a lifetime’s work ahead of her, the implication being that Percy would not be able to support her. Seven years later, as soon as Percy turned 21 in fact, the couple were married at St Silas’ Church, Pentonville, not far from where they were living in Vittoria Street. The certificate shows that Percy’s father was a Coachman and Lou’s a Tailor. 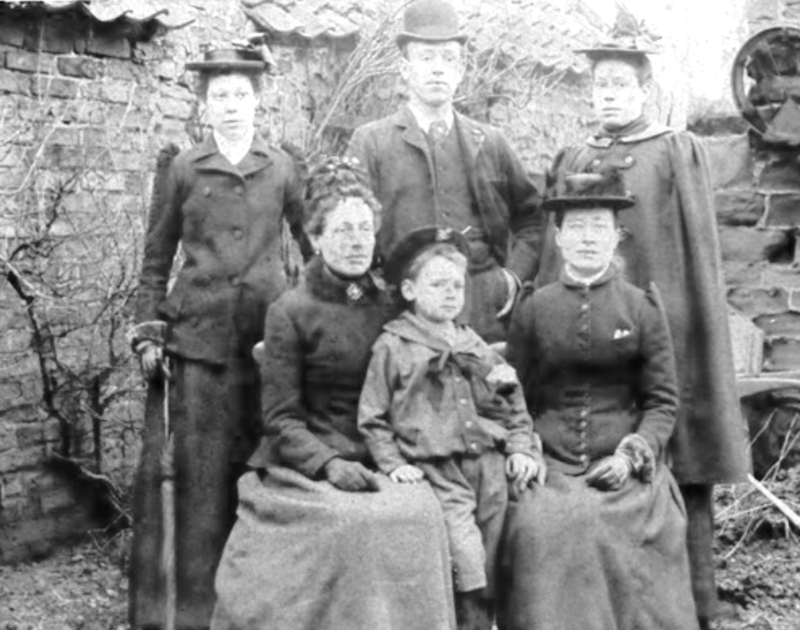 Nannie remembered that her mother had learned tailoring from her father, Joseph Seary. Lou specialised in making waistcoats and had used to sit under the table to work, whilst all around her was the chatter of German piece-workers helping to get the garments finished on time. Before settling down with Percy, Lou had ‘walked out with’ a young man by the name of Gady (?) On one occasion, after being taunted by a group of youths whilst out walking, Mr Gady had flicked his coat-tails at the lads – an action which was the equivalent of saying “kiss my arse!” That got him dumped. Lou didn’t like his (lack of) manners. 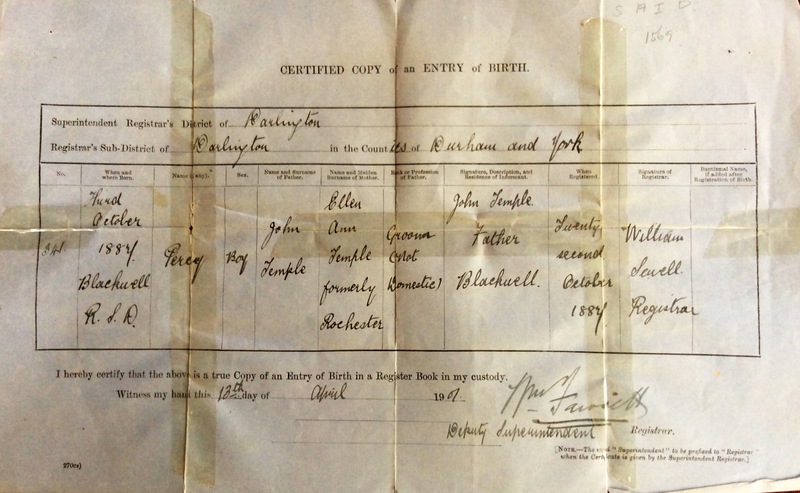 Percy’s birth certificate prompted another story about a mystery which has never been solved. Percy Temple had been born in Darlington in 1887, the eldest son of John Temple, the groom (and later coachman) at Blackwell Hall and his wife Ellen Ann née Rochester. The couple went on to have 12 children in total, 10 of whom survived into adulthood. However, they gave Percy away. Some time between 1891 and 1901 Percy went to the other end of the country to live with Jack & Jinnie Lewis née Temple in London. Fortunately, the move seemed to work out well for Percy. He trained as a Sign-Writer, met his wife and started a family. Over a decade ago I made contact with a cousin of Nannie’s who had numerous photographs (including the one above), documents and family stories relating to the Temples. However, she could not give me an explanation as to why Percy had been ‘adopted’. His 9 surviving siblings remained in the Darlington area and my grandmother remembered going to visit her aunts, uncles and cousins. In fact, she named my father after one of these uncles whom she regarded as her ‘favourite’. But Nannie never met her grandmother. 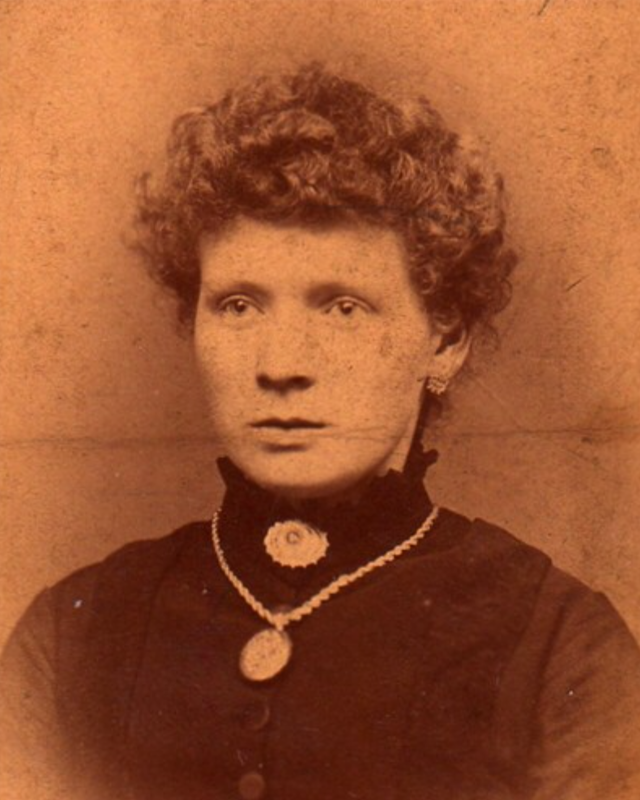 (Her grandfather, John Temple, had died in 1910 when Nannie was a baby). I assumed that Ellen had died young, worn out after all those children. But she didn’t. Ellen Ann Temple died in 1942 at the age of 83. Nannie was in her early thirties with two children of her own. I was sent this photograph of my Great Great Grandmother in 2008. Nannie died in 1989 so she never got to peer into those eyes and wonder what ever had induced Ellen to give up her eldest son? And was that the reason why she never got to meet Percy’s family?